I’m not from New Orleans nor do I observe Lent, but, ANY excuse for me to cook a themed meal & I am all over it! I cooked our Mardi Gras dinner last night so YOU could read the post today and get some ideas for your own Mardi Gras dinner tonight. Preheat oven to 400º. Line a baking sheet with foil. Place vinegar, oil, mustard, dried oregano, Giardiniera vegetables and olives in a food processor and pulse until vegetables are minced. Chop meats and stir into Giardiniera mixture. Place ciabatta halves on baking sheet. 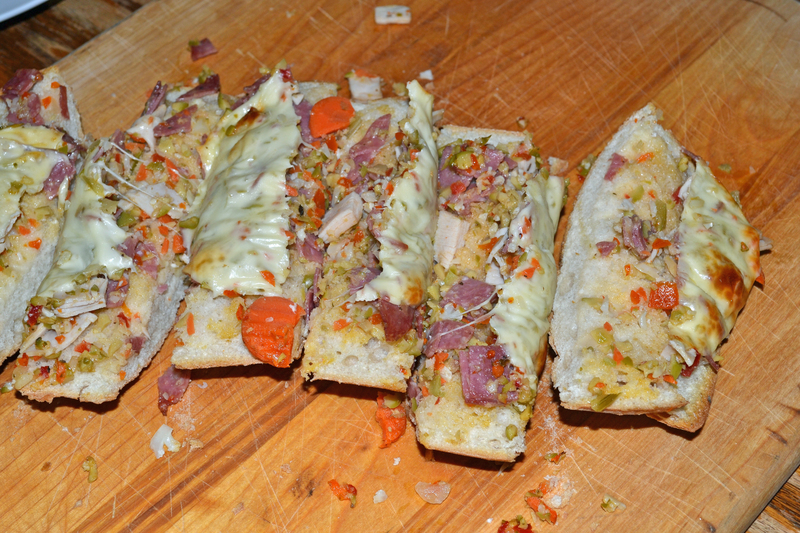 Spoon Giardiniera-meat mixture evenly over bread and top with mozzarella slices. 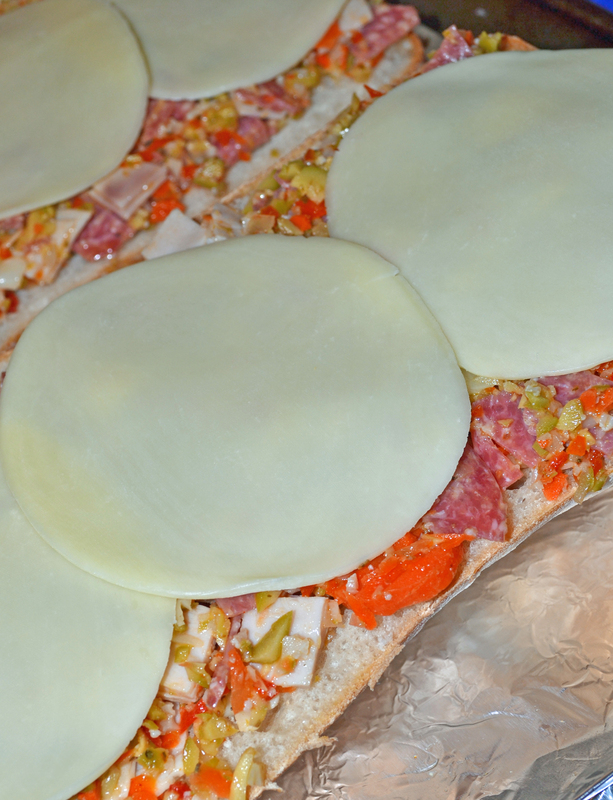 Bake until cheese melts and meat is hot, 20-25 minutes. Slice each ciabatta half into 6-8 slices. This is fabulous as an appetizer for a party or watching the big game. Melt butter over medium heat. 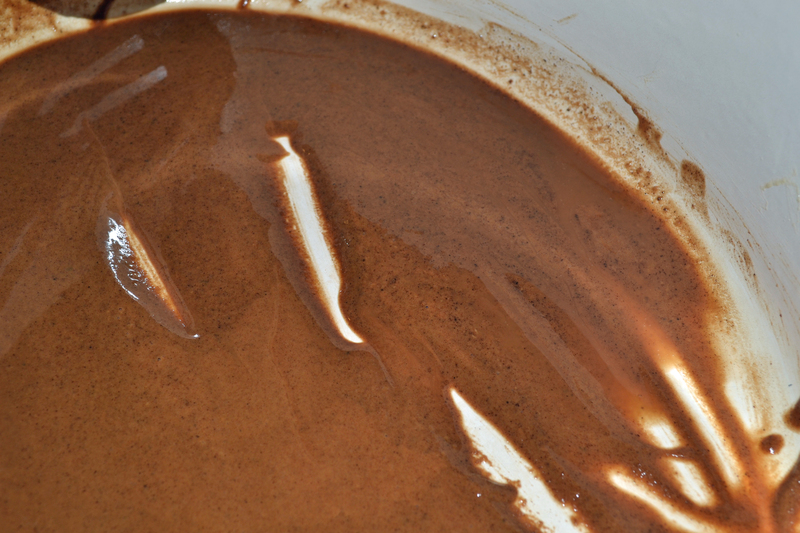 Add flour and cook, stirring constantly, to make a dark roux (the color of chocolate). 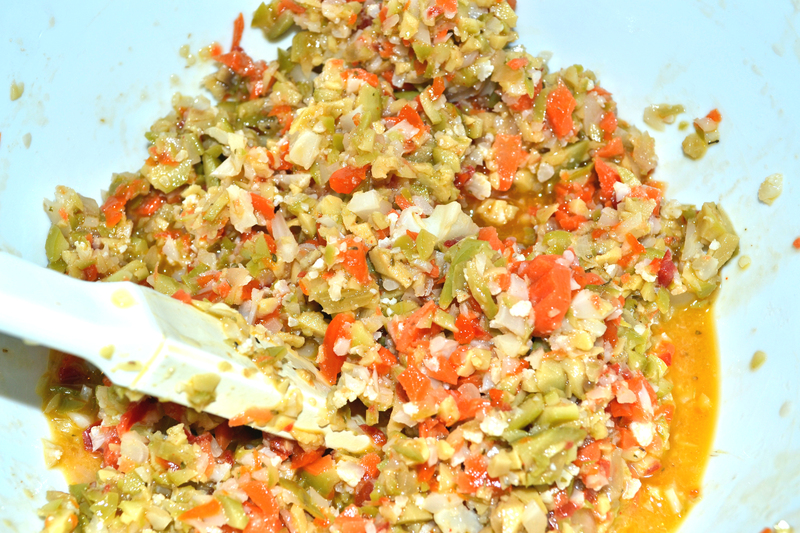 Add onion, celery and bell pepper (the “trinity”); cook until tender, about 10 minutes. Add garlic & cook 1 minute. Add both tomatoes, bay leaves, water, salt & cayenne. Bring to a boil, reduce heat, and simmer 15 minutes. Meanwhile, toss shrimp with creole seasoning in a medium bowl. Add Worcestershire sauce, and hot sauce (if using) to tomatoes in pot. Mix to incorporate, then add shrimp. Cook 4-6 minutes (depending on the size of your shrimp), until fully cooked. 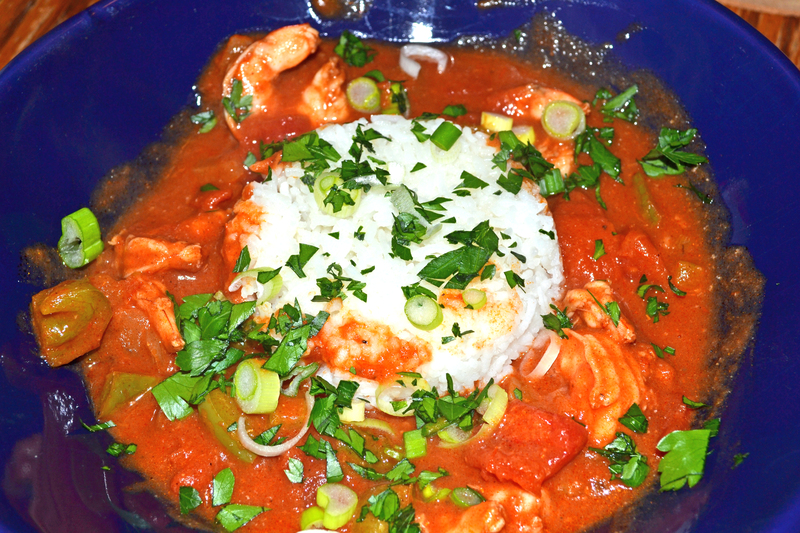 Serve over white rice, garnished with parsley and scallions. Pass additional hot sauce at the table. For a nice presentation, mold rice into ramekins and invert onto large shallow bowls. Spoon shrimp & sauce around rice. Garnish. Place romaine, cabbage, tomatoes & cucumbers in a large bowl. Whisk vinegar, oil, mustard & garlic together. Taste & season with salt if needed. 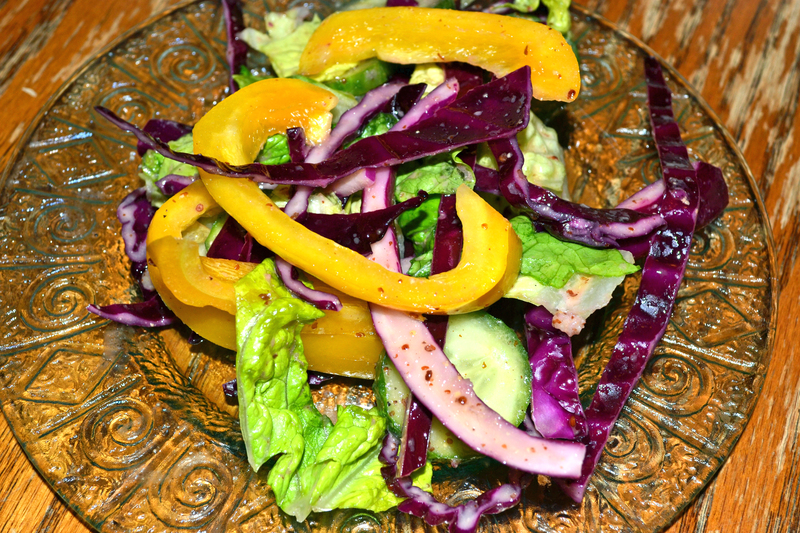 Toss dressing with salad. Serve salad on chilled plates and top each with a pepper ring (I completely got distracted while cutting my yellow pepper and ended up with strips instead of rings). Good friends of ours had an Age of Aquarius party last night for their joint birthday. Of course I had to cook something to bring. 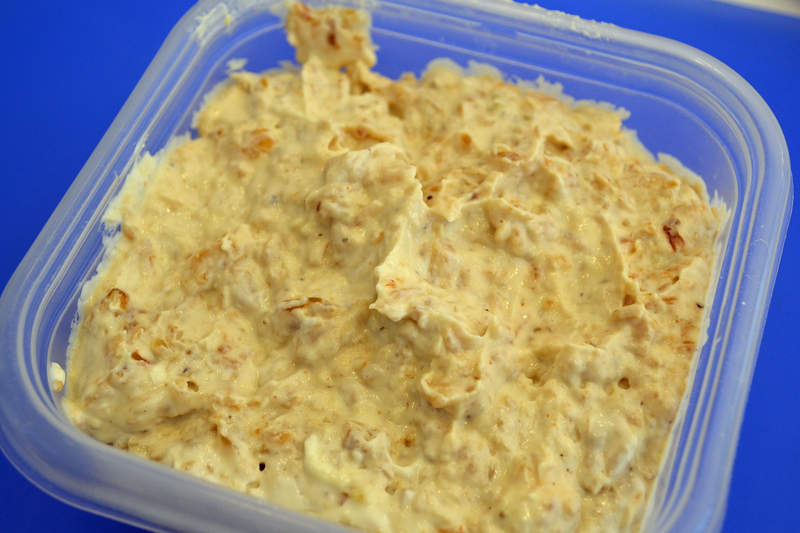 I picked a caramelized onion dip and sun-dried tomato dip, both from Barefoot Contessa. Heat the butter and oil in a large sauté pan on medium heat. Add the onions, cayenne, salt and pepper and sauté for 10 minutes. Reduce the heat to medium-low and cook, stirring occasionally, for 20 more minutes, until the onions are browned and caramelized. Allow onions to cool. Place the cream cheese, sour cream and mayonnaise in the bowl of an electric mixer fitted with a paddle attachment and beat until smooth. (I use my food processor fitted with a metal blade.) Add onions and mix well. Taste for seasonings. 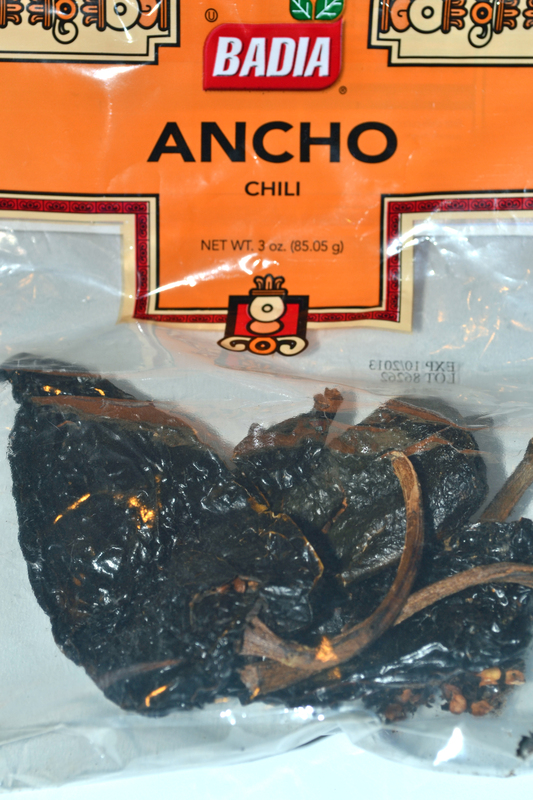 I serve this with Kettle Brand potato chips – either the Sea Salt variety or Salt and Fresh Ground Pepper. You could also serve with fresh vegetables and crackers for dipping. Purée the tomatoes, cream cheese, sour cream, mayonnaise, Tabasco, salt and pepper in a food processor fitted with a metal blade. Add the scallions and pulse twice. Serve at room temperature. When I am serving this with the onion dip above, I use the same Kettle Brand potato chips for both. You could also serve with crackers and fresh vegetables. Do not substitute the dry sun-dried tomatoes for the oil-packed ones; the flavor will not be as intense. Wednesday I cooked several recipes for dinner from the third cookbook that I received for Hanukkah (see here and here for posts about the first two cookbooks). This one was a gift from my in-laws and is titled Jerusalem: A Cookbook by Yotam Ottolenghi and Sami Tamimi. I was able to find all of the ingredients at my local Publix (which admittedly does have an extensive ethnic aisle). Two of the dishes had several sub-recipes included and I tried to get a lot of the prep work done in the morning between carpool runs. It was still an extensive undertaking on a weeknight. On top of that, Wednesday is robotics night for Andy so we had to be done with dinner and out the door by 5:30pm. Dinner turned out delicious in spite of the disaster I created in the kitchen. Mental note – don’t try to cook four brand new recipes for the same meal. Below are the recipes with my notes in red. Also, steps of the recipe that I skipped are omitted for brevity’s sake. Put all the meatball ingredients in a bowl and use your hands to mix everything together well. Now shape into long, torpedo-shaped fingers, roughly 3¼” long. Press the mix to compress it and ensure each kofta is tight and keeps its shape. Arrange on a plate and chill until you are ready to cook them, for up to 1 day. 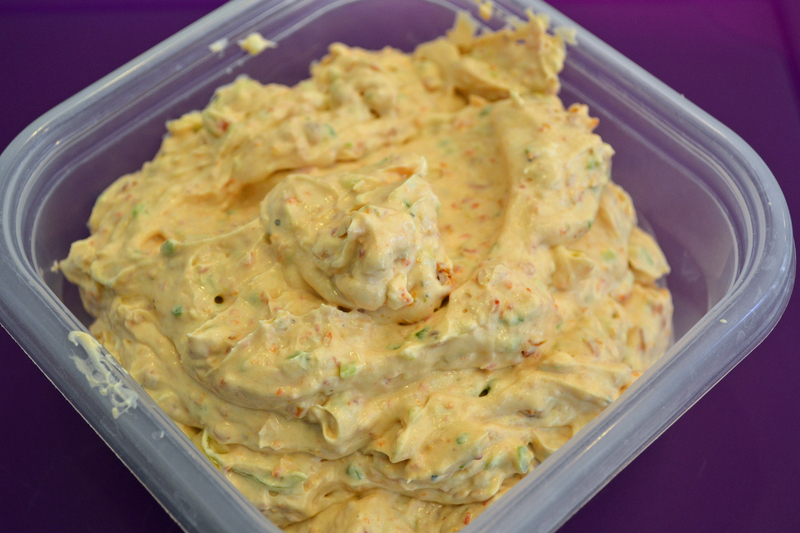 Make the tahini sauce: In a medium bow, whisk together the tahini paste, lemon juice, water, garlic and ¼ tsp. salt. The sauce should be a bit runnier than honey; add 1-2 Tbsp. water if needed. (The tahini sauce will thicken as it sits so add more water just before serving if you are making it ahead of time). Preheat oven to 425º. Heat sunflower oil in a large frying pan over high heat and sear the kofta. Do this in batches so they are not cramped together. Sear them on all sides until golden brown, about 6 minutes per batch. Lift out of the pan and arrange on a baking sheet. Put the baking sheet in the oven for 2-4 minutes. 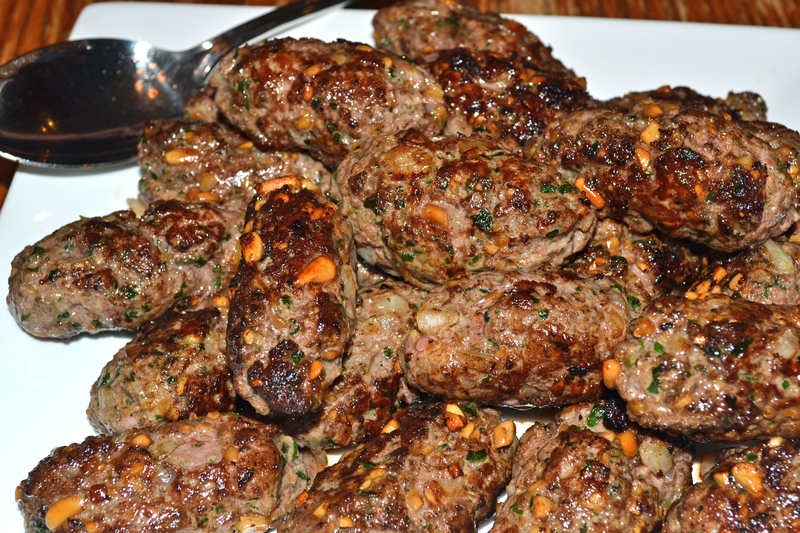 Once they come out of the oven, scatter the kofta with the pine nuts and parsley and then sprinkle with the paprika (which I forgot). Serve at once. Verdict – really really yummy. Andy thought the spice combination was weird. 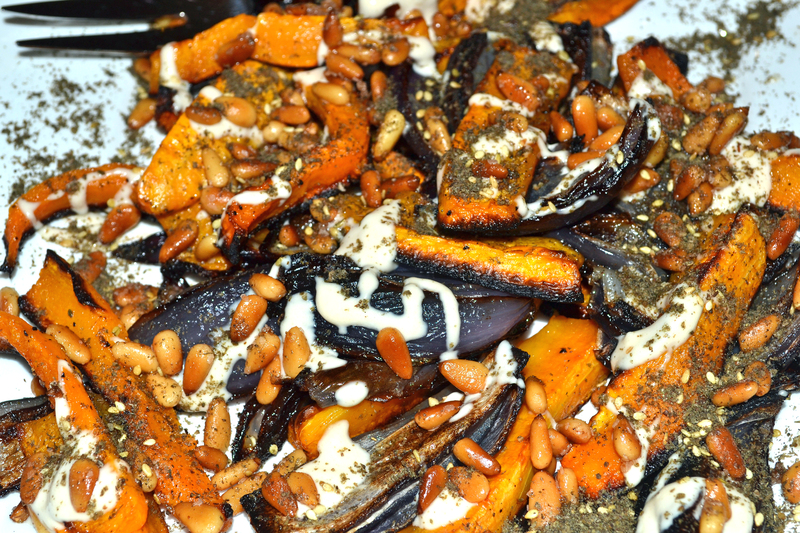 Very good with the tahini sauce. Will definitely make again! This was a close second for my favorite of the four recipes. 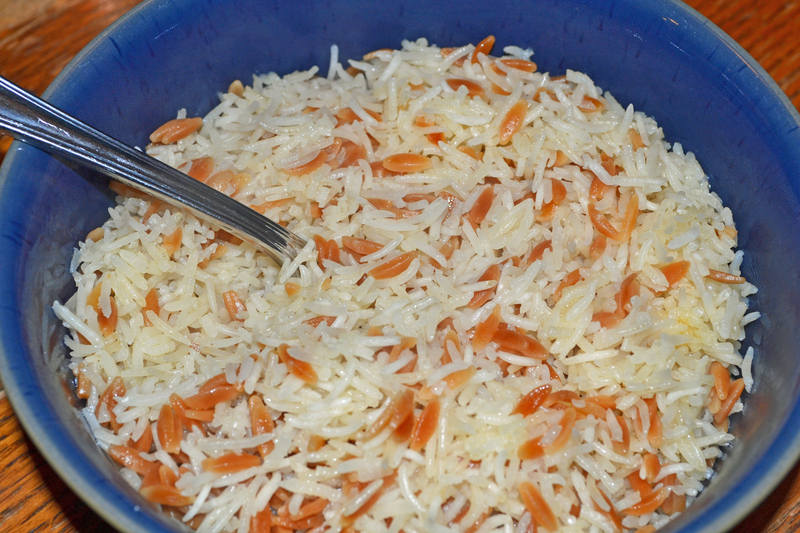 Wash the basmati rice well, then place in a large bowl and cover with plenty of cold water. Allow it to soak for 30 minutes, then drain. Heat the butter and oil over medium-high heat in a medium heavy-bottomed saucepan for which you have a lid. Add the orzo and sauté for 3 to 4 minutes, until the grains turn dark golden. Add the stock, bring to a boil, and cook for 3 minutes. Add the drained rice and salt, bring to gentle boil, stir once or twice, cover the pan, and simmer over very low heat for 15 minutes. Don’t be temped to uncover the pan; you’ll need to allow the rice to steam properly. Turn off the heat, remove the lid, and quickly cover the pan with a clean tea towel. Place the lid back on top of the towel and leave for 10 minutes. Fluff the rice with a fork before serving. Verdict – Yummy. Not worth the effort unless the other dishes are really easy. In the cookbook, this salad is served with warm spiced chickpeas on the side. According to the authors, “The salad also works on its own without the chickpeas;” which is what I did. 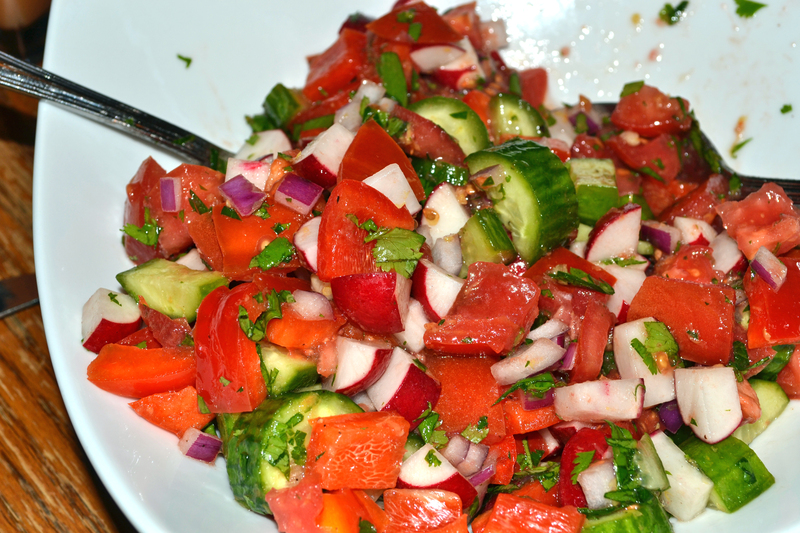 Cut the cucumber, tomato, radish, and pepper into ⅔” dice; cut the onion into ¼” dice. Mix everything together in a bowl with the cilantro and parsley. In a jar or sealable container, mix olive oil, the lemon juice and zest, vinegar, and garlic and mix well to form a dressing, then season to taste with salt and pepper. Pour the dressing over the salad and toss lightly. Verdict – good. I prefer my version of a chopped fresh vegetable salad, which I call an Israeli salad. However, I will plan on making it again in the summer with garden fresh vegetables instead of what you can find in the dead of winter in the grocery. I think the cucumbers and radishes could have been crisper and sweeter. I halved this recipe and, served with the other dishes, it was the perfect amount for three people (Andy wouldn’t touch it with a ten foot pole). Also, I peeled the squash even though it didn’t specify. The squash would probably have held their shape better, and not started to blacken, if I hadn’t but it was easier to eat. Preheat the oven to 475º. 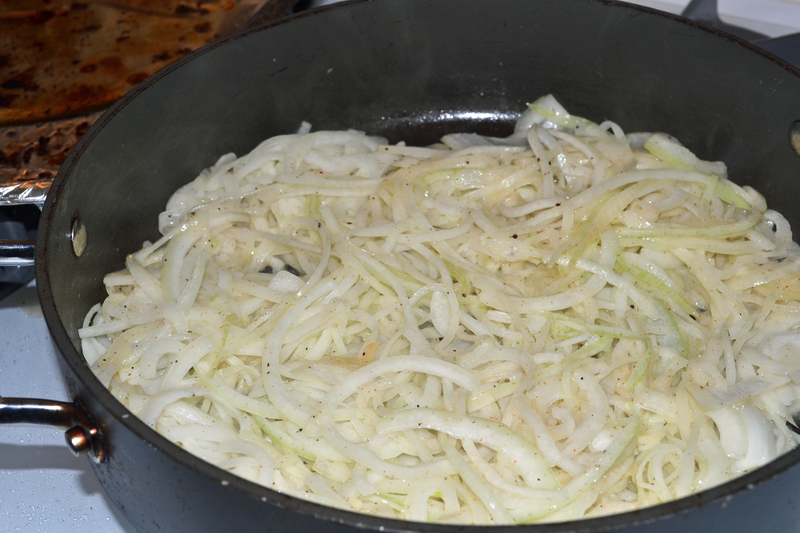 Put the squash and onion in a large mixing bowl, add 3 Tbsp. of the oil, 1 tsp. salt and some black pepper and toss well. Spread on a baking sheet with the skin facing down and roast in the oven for 30 to 40 minutes, until the vegetables have taken on some color and are cooked through. Keep an eye on the onions as they might cook faster than the squash and need to be removed earlier. Remove from the oven and leave to cool. (I cooked this for exactly 30 minutes and it was too long. Will start checking at 20 minutes next time). 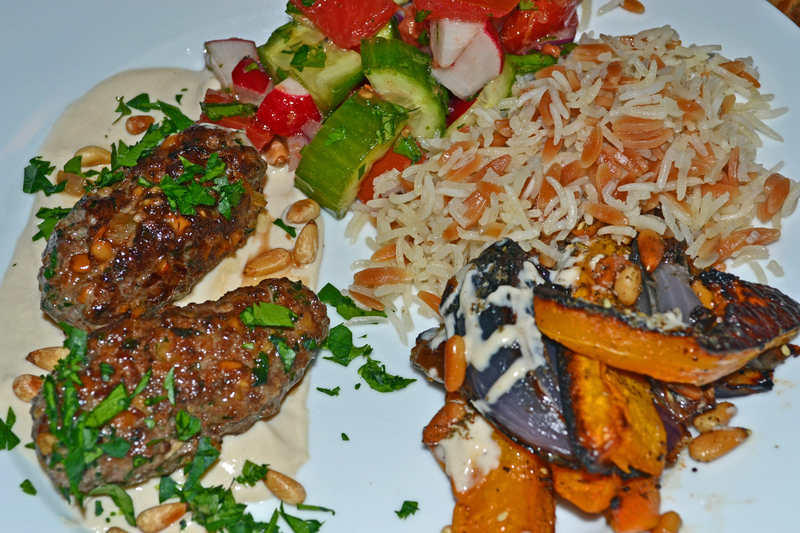 To make the sauce, place the tahini in a small bowl along with the lemon juice, water, garlic and ¼ tsp. salt. Whisk until the sauce is the consistency of honey, adding more water or tahini if necessary. (The tahini sauce will thicken as it sits so add more water just before serving if you are making it ahead of time). Pour the remaining 1½ tsp. oil into a small frying pan and place over medium-low heat. Add the pine nuts along with ½ tsp. salt and cook for 2 minutes, stirring often, until the nuts are golden brown. Remove from the heat and transfer the nuts and oil to a small bowl to stop the cooking. Verdict – delicious! Will definitely make this again. I’m generally not fond of winter squashes and sweet potatoes because I find them too sweet for my tastes. However, the savory seasonings on this butternut squash were fabulous. This was probably my favorite of the recipes I cooked. 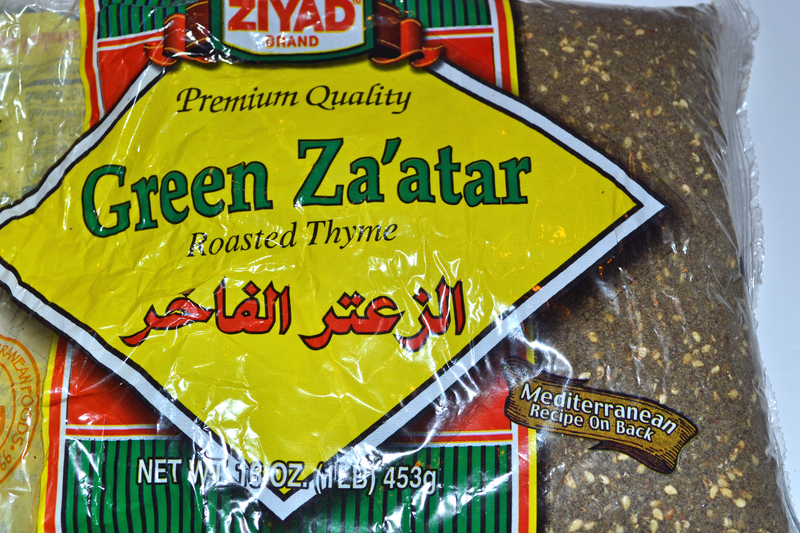 Za’atar is a middle-eastern spice blend. The version I found at my grocery contains roasted thyme, ground sumac (different from the poisonous American sumac), sesame seeds and salt. 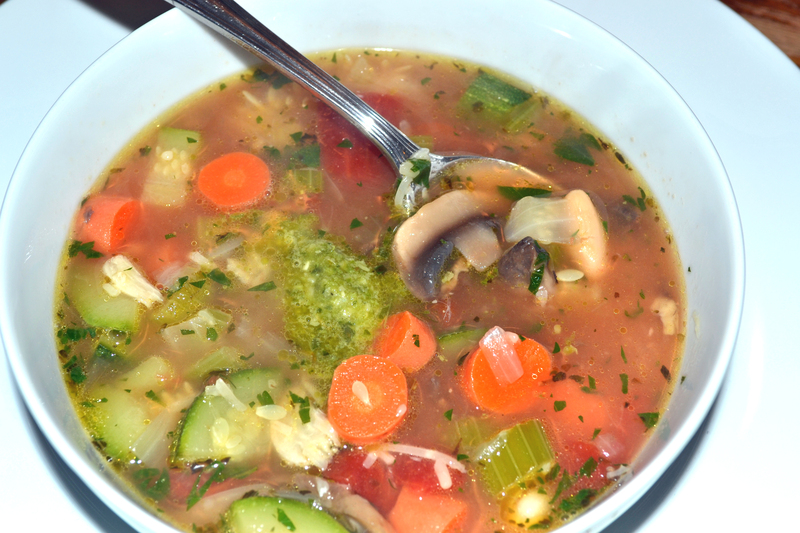 Another soup to cure a cold (see my post on Mexican Chicken Soup). This one is scented with garlic and full of good-for-you vegetables. Heat oil over medium-low heat in a deep heavy pot such as a Dutch oven. Add garlic slices. Cook for 5 more minutes; try not to let them brown. Add onion, carrot & celery. Turn up heat to medium-high & cook 5 minutes. 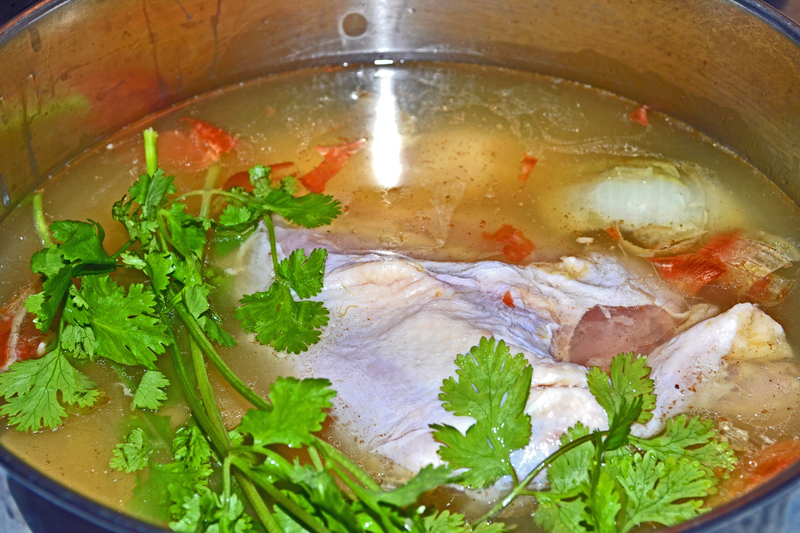 Add broth and dried herbs. Bring to a boil, cover and reduce heat. Simmer for 15 minutes. Add mushrooms & zucchini. Bring back to a boil, cover & reduce heat. Simmer 10 minutes. Check vegetables for done-ness – simmer 5-10 more minutes if needed. Taste for salt & pepper and season accordingly. Add diced tomatoes, beans & fresh herbs. Bring to boil to incorporate the beans & tomatoes. Serve with freshly grated Parmigiano-Reggiano and pesto on the side. If you really want to wow your diners, serve with homemade croutons for garnishing the soup. Soup is, in general, a very forgiving dish to make. Using high-quality ingredients is important as is cooking each the appropriate length of time. Feel free to personalize according to your own tastes and what you have already in your kitchen. You can substitute tortellini, rice, ditalini pasta or potatoes for the cannellini beans but you should cook them separately and then add to the soup. If you cook them directly in the soup they will absorb too much of the delicious garlic-flavored broth. Enjoy! Let me know what your favorite soup is for cold rainy days. Happy February everyone! Where in the world did January go to? I was sick with a head cold all last week (thankfully I had several posts already written & ready to go) and didn’t feel up to cooking until Friday. By then I was ready for a big, piping hot bowl of sinus-clearing soup. 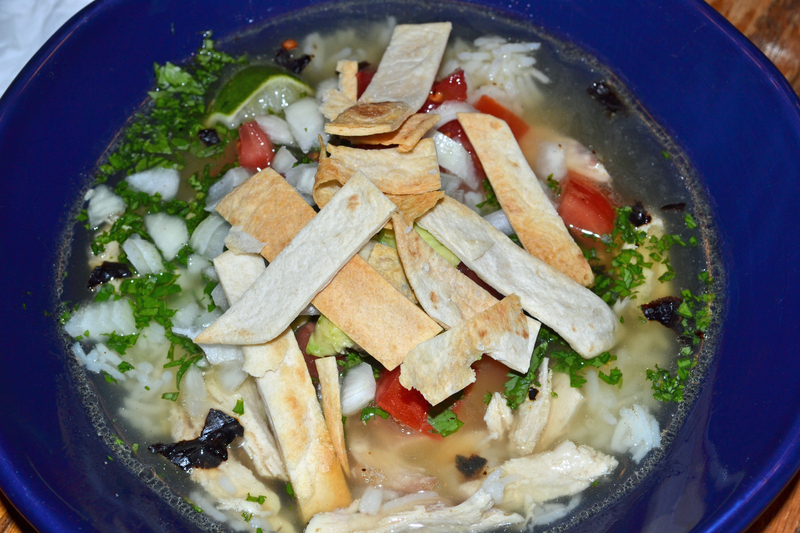 Even better, this Mexican Chicken soup is still delicious when you aren’t sick. 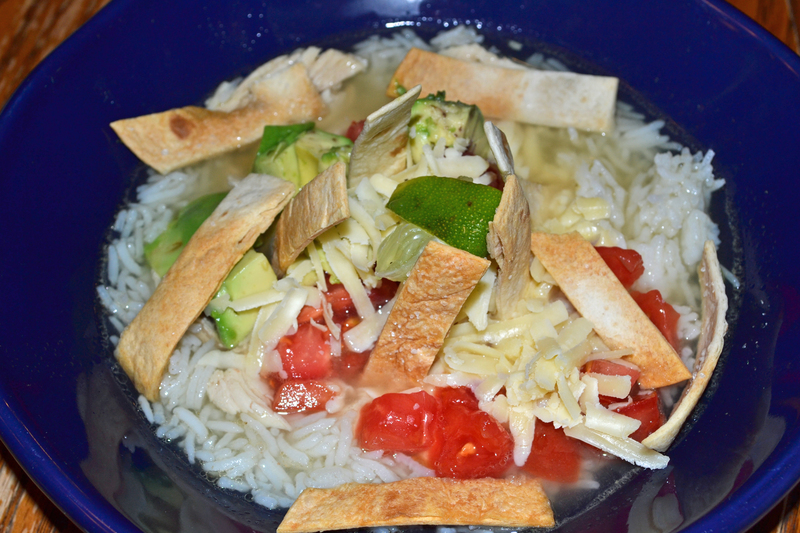 This recipe is not a tomato- and/or chile-based tortilla soup; it is a clear golden broth with chicken, seasoned with Mexican flavorings and then served with a plethora of different mix-ins for each diner to personalize their bowl with (all the better when you have picky eaters in your family). Frequently I have homemade chicken broth in my freezer that I will use (whenever I buy a rotisserie chicken I either make chicken broth immediately or freeze the carcass to make broth with later) but, if you don’t, just use a boxed low-sodium chicken broth. I went spelunking in my freezer and found a container of turkey broth from Thanksgiving! Add all ingredients to a large pot. Bring to a boil and reduce heat to a low simmer. Cook for 30 minutes, covered, skimming off the foam as needed. Remove chicken and set aside to cool. Simmer broth & vegetables for an additional 30 minutes. Remove vegetables. (Optional – strain soup through a cheesecloth-lined sieve into a clean pot). When cool enough to handle, pull chicken pieces off the bones, shred with your fingers and return to the soup pot. Discard chicken bones and skin, garlic, onion & cilantro. Bring soup back to a boil and taste; add salt if needed. Serve soup piping hot with tortilla strips and mix-ins. If you are serving more people add a salad or make a platter of quesadillas to go alongside. I used 5-6 of the smallest flour tortillas (“fajita” size) I can find at my local grocery. Basically I lay them put whole on my baking sheet to see approximately how many I can fit & that’s what I use. Place one tortilla on a cutting board & lightly spritz with spray oil. Flip over & spritz the other side. Season with salt. Place second tortilla on top, spritz with spray oil & season with salt. Continue adding tortillas in this manner. 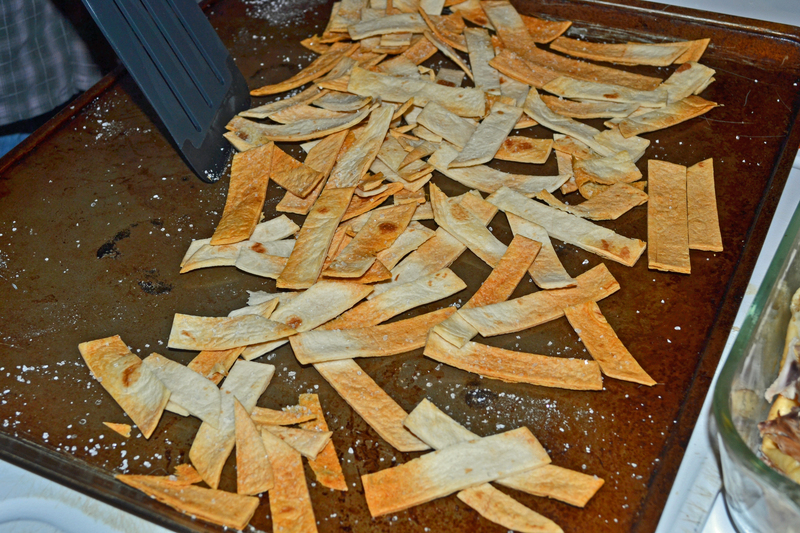 Cut the stack of tortillas crosswise in half and then lengthwise into strips. Scatter evenly across your baking sheet. Bake at 350º for 10-15 minutes. Watch closely, they go from under-cooked to perfect to burnt quickly. Start with large spoonful of rice then ladle in broth & chicken. Squeeze a lime wedge over your bowl and then drop said lime wedge into your soup. 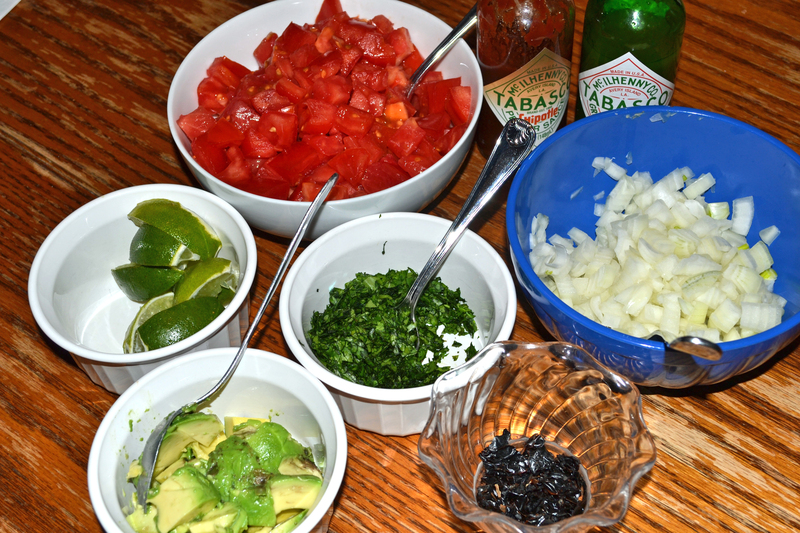 Add tomatoes, onions, cilantro, cumbled ancho peppers, avocado & tortilla strips. If you are sick, have with a large glass of orange juice, otherwise a Mexican beer would be perfect. Cheers!! This teriyaki marinade is quite easy and so much better than a store bought one. 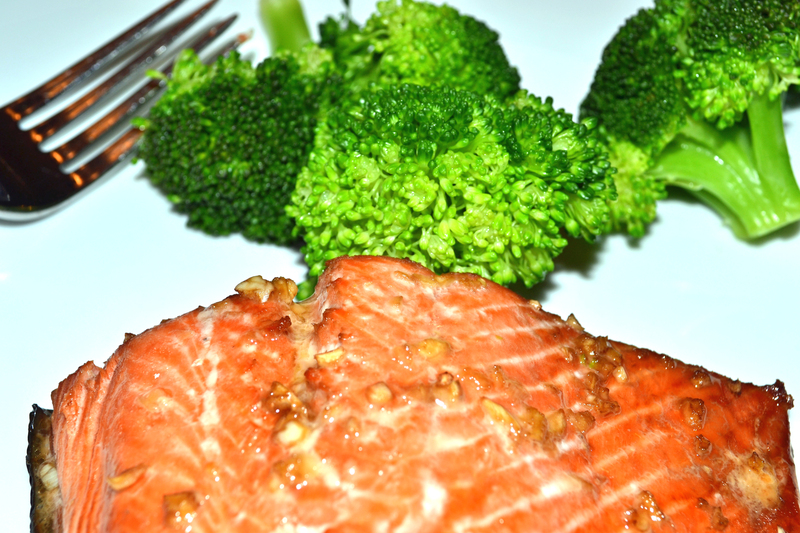 You do need to plan ahead a little because it will need to cool before you marinate your raw protein. The recipe comes from an old Williams-Sonoma cookbook, Chicken for Dinner. In a small saucepan over high heat, combine all ingredients. Stir well and bring to a boil. Boil for one minute, then remove from heat. Pour into a shallow bowl and let cool completely. 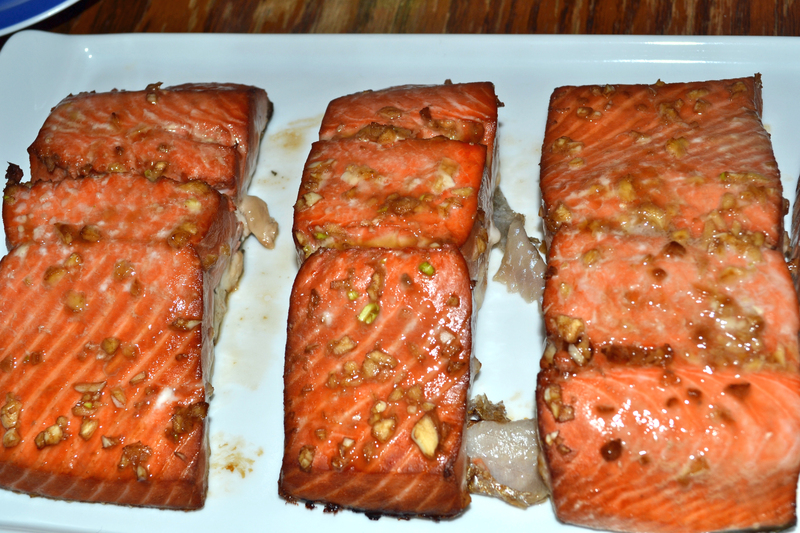 Once cool, use to marinate 4 servings of chicken or salmon or use as a basting sauce while cooking. I like to put both the ginger chunk & garlic cloves in my mini food processor and pulse them together until minced. When I made this last I served it with some simple steamed broccoli, sushi rice (known in our house as sticky rice) and an Asian-inspired salad with baby spinach, slivered red peppers & sliced raw mushrooms. I whipped up a simple vinaigrette with rice wine vinegar, soy sauce & canola oil. Sometimes you just want some delicious comfort food. 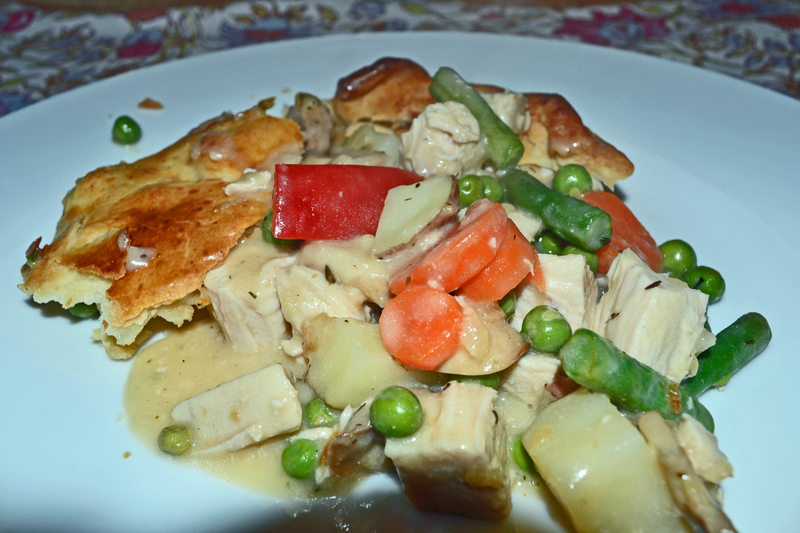 For me, chicken pot pie is one of those dishes that I want to be eating when it is cold and raining (or worse) outside. My recipe doesn’t use a can of “cream of XYZ soup” – it’s all from scratch except the crust (which will be my next project). Preheat oven to 435º. Place diced red pepper and peas in a large bowl. Cook green beans until just barely crisp tender. Transfer to bowl with red pepper & peas. Cook carrots until just barely cooked & added to bowl with other vegetables. Cook potatoes until just barely cooked and add to vegetable bowl. (I cook all these vegetables separately in the microwave but you can also boil or steam them). Poach chicken, cool and cut into large dice. Add chicken to vegetables. Melt butter in a large saucepan over medium high heat. 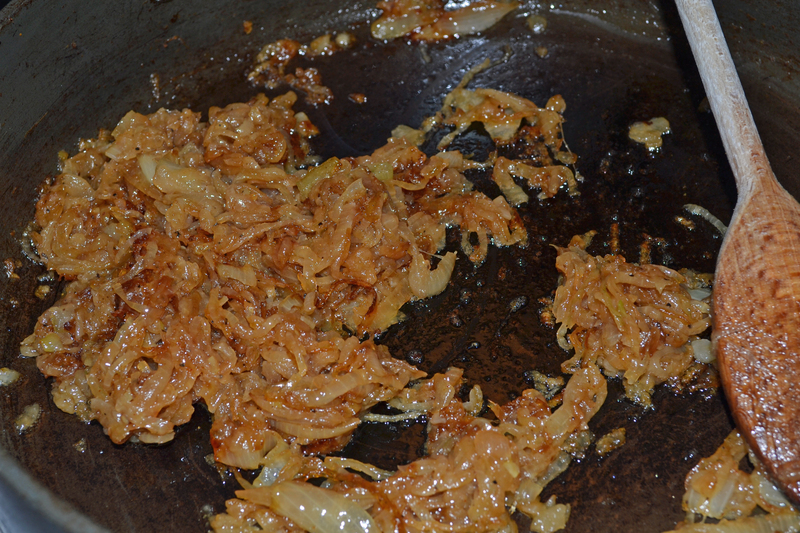 Add mushrooms and onions and cook until softened and liquid has evaporated. Add flour, pepper and thyme. Cook and stir until combined. Whisk in broth and milk. Increase heat and simmer, stirring constantly, until thickened slightly and smooth. Add reserved vegetables and chicken to saucepan and mix to combine. Pour into a 2 qt. baking dish. Top with piecrust and crimp edges. Cut 5 slits in top of crust to vent steam. Whisk egg yolk with 1 tsp. cold water. Lightly brush egg wash on crust. 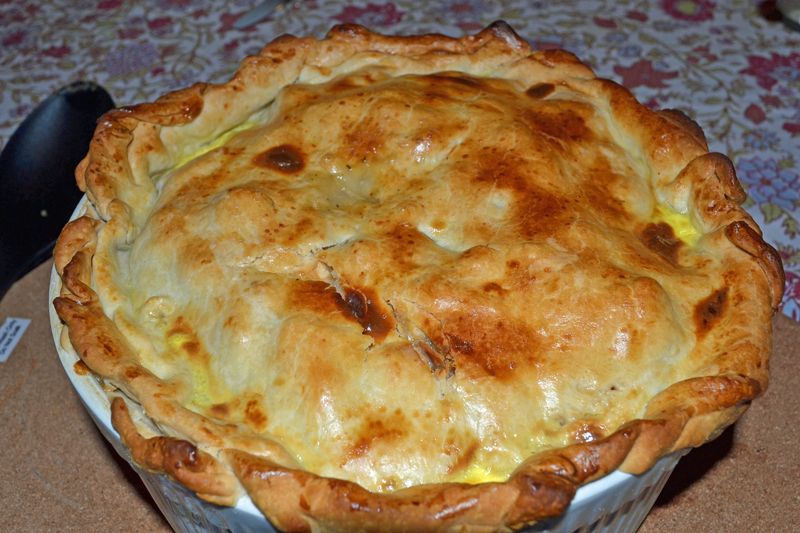 Bake for 20-30 minutes until crust is lightly browned and filling is bubbling. Let sit for 5-10 minutes before serving.